You expect the “Best”. Luckily, with GreenMail Email Marketing, you can reach out to customers and prospects with great content and products while our staff takes care of the rest. Our system is designed to adapt to all size devices while tracking all clicks and opens of each subscribed member on your list. GreenMail Email Marketing offers a Free Forever plan up-to 100 names and a starting price of only $9 a month for more that 100 Active database names. We have you covered with Mobile viewing. Emails built in our drag and drop editor are built to automatically adapt to all phones, tablets, and desktop sizes, giving you a competitive advantage and a break from testing frustration. With the launch of our drag and drop builder, we’ve seen steady growth in engagement and click-throughs. Why mobile? No more pinching, turning, or squinting! This mobile-friendly feature will make your emails easier to read and easier to engage with. What does this mean for my business? 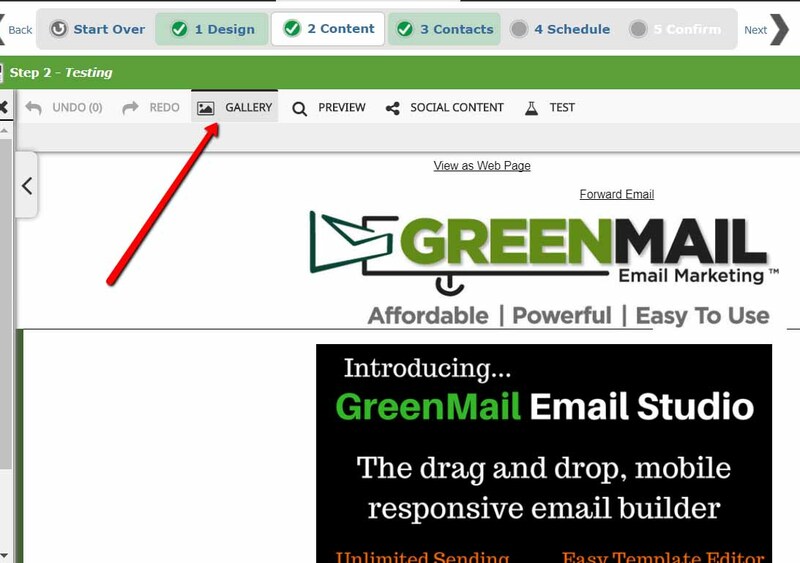 With our drag and drop software, outsourcing an email developer isn’t required. Our builder requires no HTML or coding experience, giving you the ability to design with freedom. Test the design and overall look in our side-by-side mobile preview. We teamed with Pixabay to bring you their entire library of free stock into your email account for no extra cost. 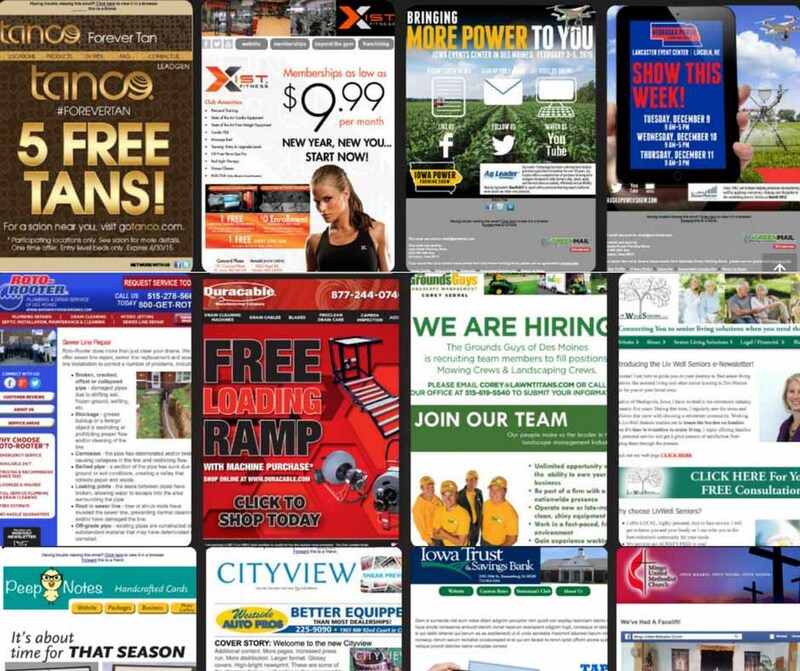 Search, edit, and incorporate thousands of images into your newsletters for FREE. All images within this partnership library are legal (COO licensing for commercial use). Take advantage of our images to add to your email campaign. Insert within articles. Add an image to advertising boxes. Grab the image and re-run to duplicate with your print or postal direct mail cards. Steps are below to access and show you the gallery. 1. 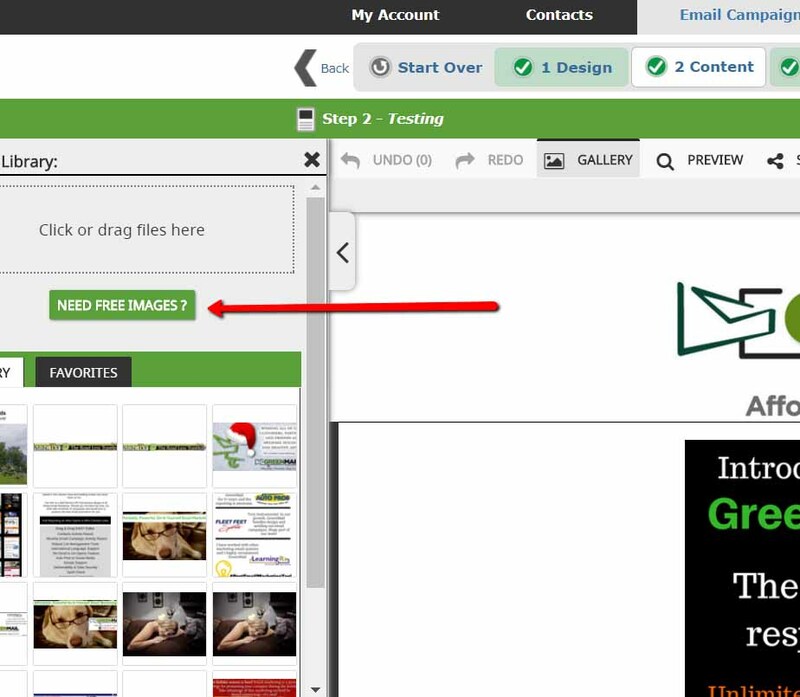 Access and open your GreenMail Email Marketing To access the stock photo library, you must have a campaign open. If you don’t have an account with us, sign up for free (no credit card required). 3. While in the “Gallery” view, you’ll see a large orange button that says, “Need Free Images?” Click on it to access the free library. 4. A new window will populate on the screen and offer a few options. Configure any settings you need and type a general topic into the search bar. Push “search” to move forward. 5. 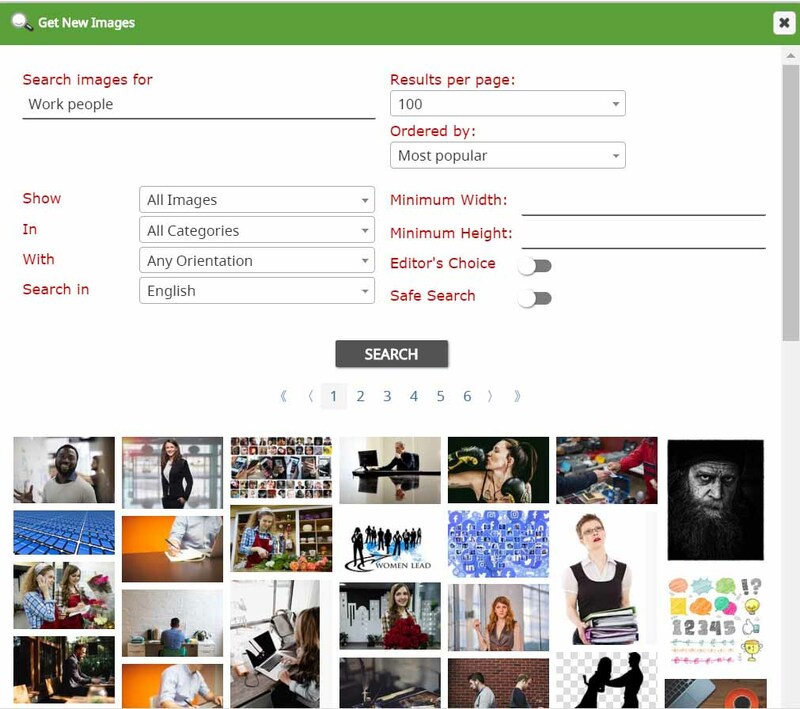 Once you find an image (of a group of images you like), simply click on the thumbnail to add it to your library. While it’s loading, explore more images or exit out of the screen. Exiting the screen will not stop the upload process. 6. 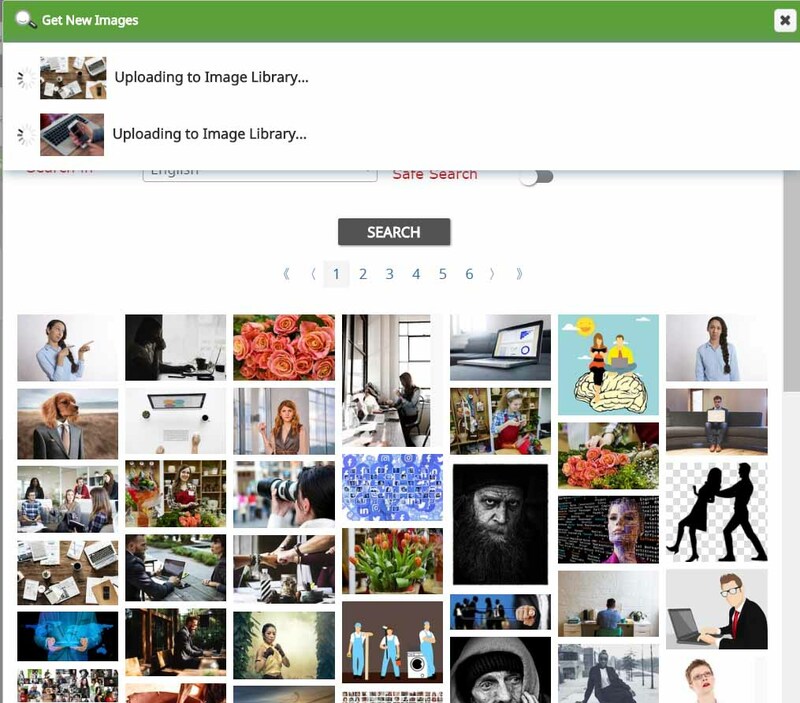 The free stock photos you chose will automatically appear in your image gallery once it finishes uploading. To add it to your email, use your mouse to drag it from the library to the desired image block within your email campaign build. Integrating DMARC/DKIM isn’t an option anymore – it’s necessary if you want to land in your subscriber’s inboxes. Major ESPs and ISPs (like Gmail and Yahoo), will mark your email as spam they can’t find specific records through DNS that authenticate the sending. Should you have questions on this. Feel free to give us a call. After years of data collecting and market monitoring, we can confirm that automated email messages aren’t just a trend – it’s a way of communication. Automated emails allow you important information instantly and can build a solid relationship without having to sacrifice your time. Sending welcome emails is the best way to establish a connection and open the lines of communication. Once someone subscribes to your database list, you can have our system automatically send that New database member a “hello” that describes your brand, a special message, Maybe even an “introductory” special price. Should you need to change the content? simply edit the campaign (or start over) while updating the automation settings. We’ve seen drip email campaigns work great! Creative way to get your customer’s attention and keep them involved without being “pushy”. Send at certain intervals after you have designed. Feature blogs and products, or just send a few personalized emails to your customers and prospects with this EASY to create drip option. Configuring and optimizing trigger campaigns will increase consumer engagement and sales. “Triggers” are emails that are sent automatically based on what the subscriber showed interest in before. For example, if you send an email blast about “Check Out Our New Website” and they clicked on the “Go to Our Website” button. You should design a follow-up email that features about what your company offers and thank them for visiting your New Website. We thank you for checking out this post and reading this info. If you need help accessing the free stock photo library or configuring automated emails, send us an email or feel free to call us. We want you to get the most clicks and success from your email campaigns. Explore our library of free templates and graphics.